With a Sitka spruce top and sapele back and sides, this solid wood Dreadnought model is a great sounding guitar at an affordable price. New to this model are stunning mother-of-pearl pattern fingerboard and rosette inlays with a multi-stripe rosette border. It has an FSC® Certified Richlite® fingerboard and bridge, satin finish body, and a hand-rubbed neck finish. Also new to this model is the Fishman® MX-T electronics package with a built-in soundhole tuner that auto mutes the audio output so you can tune up any time without using a pedal. This guitar comes with a premium soft-shell case so it is Road-ready to join you on all of your adventures! Martin’s next generation Lifespan 2.0 strings are engineered using a new, patented technology only available from Martin. This technology was developed to protect the core wire and the wrap wire to prevent corrosion without compromising tone. Authentic Acoustic Lifespan 2.0 strings look better, sound better, and feel better, providing a smooth playing experience that reduces finger drag. Martin Authentic Acoustic Lifespan® 2.0 strings offer next generation treatment for long life, great playability and feel, and superior reliability with authentic tone. Want to win? 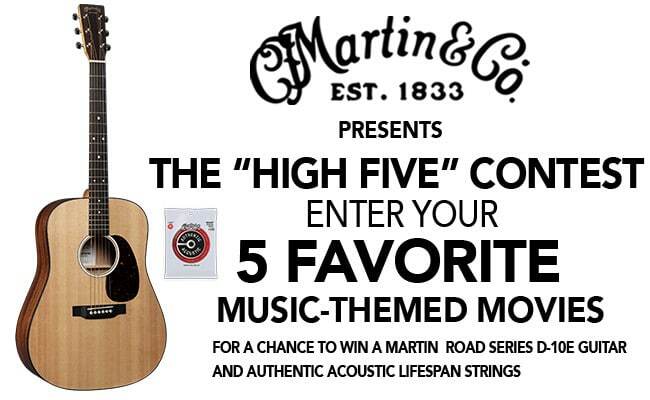 Simply fill out the form below and tell us your “5 Favorite Music-Themed Movies” and you’ll be entered to win the Martin D-10 guitar and set of Authentic Acoustic Lifespan 2.0 strings. Selected entries will be printed in our May/June 2019 issue. Deadline: March 31st, 2019 at 11:59pm CST.